Retro consoles like the NES Classic Edition and Super NES Classic are tons of fun, and the Nintendo Switch is the hottest video game console on the planet right now. Wouldn’t it be cool if there was a single device that combined them? 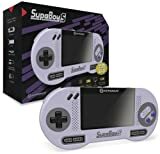 The Hyperkin SupaBoy S Portable Pocket Console does just that, combining the Switch’s portable form factor with a retro console that can play any SNES cartridge ever made. You’ve got to check it out.